“The Contessa is a great crossover piece. I have clients that wear it at home and take it out in the world.” Kaaren Bedi, Layneau. The Layneau Contessa Bed Jacket is a beautiful piece, elegant, lush and lovely to look at and I’m sure you’re customers love wearing it. What was the inspiration behind this particular style? Two things converged to bring about the Contessa Bedjacket — my personal habit of waking up early, getting my coffee and sitting in bed to do my first round of correspondence and a piece from my collection of vintage clothing. I love to sit in bed and work in the morning but I get cold. A long robe doesn’t work — it’s too hard to move — I suppose a sweat shirt is an option but really, then when looking through my collection of vintage evening pieces there it was — an opera coat from the 30s with these great sleeves it came together in my mind. One thing leads to another and voila! The ruffle at the neck keeps you warm with out being too close, the detail of the sleeve means no binding when writing or reading. The length means it covers your back but not so long as you will sit on it and being shorter in the front means it’s not in the way. Online retailer Bella Bella Boutique has a great blog section called, Ready to Wear Vs. Lingerie, an ongoing post dedicated to showing off how customers can pair lingerie with RTW for new looks. With that in mind, we think the fashion potentials for this piece are endless and wanted to know your top picks on what to pair with the Contessa Bed Jacket? How have your customers paired the piece with RTW styles? I always say, where you wear it is up to you! I love that blog…brilliant. The Contessa is a great crossover piece. I have clients that wear it at home and take it out in the world. I’m currently making one in white for a bride to wear over her dress. One client wears it over evening dresses. My favorite is when she pairs it with a smart top and jeans. I just love the relaxed luxury and ease of it over jeans. Of course it ties together with a great pair of shoes! Kaaren, could you tell us a little bit about the quality of fabrics used in the Contessa Bed Jacket? The Contessa is a cocoon of silk! Let’s start from the inside — the lining is wonderfully soft silk charmeuse with just a kiss of Lycra. It’s the same silk we use in our gowns and robes. It is what is against your skin so it has to be the softest — I hate cheap linings. Next is the batting- the fluffy stuff inside- it’s this marvelous silk and cotton quilt batting from a company in Texas! Silk is one of the most efficient insulators — its light and warm. Finally, the velvet. I always use a silk and rayon blend- 100% silk is simply too expensive. This season, I did a wonderful old world embossed velvet from a mill in England. How have customers described the experience of trying on the Bed Jacket on for the first time? Every single time they say the same thing — it feels like wearing a hug. No one ever wants to take it off! 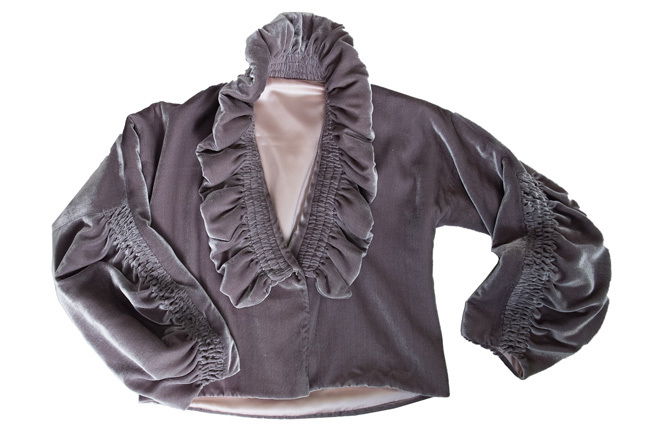 How would you recommend a retailer showcase the bed jacket, or any of your other pieces, to their clientele? On the rack it may not show it’s best. Put it on a mannequin- but better yet wear it in the store. But it really just put it on the customer. Once they put it on it’s sold. We also wanted to highlight the Isabella Collection. Could you tell us a little bit about the silhouettes that make up this collection? Isabella was my great grandmother. I only know her through pictures — mostly of her as a young bride. She was refined and very feminine. Our bridal collection is named in her honor. How have these styles evolved for this season? Beyond the robe and chemise I’ve evolved the collection to what I think of as the ‘honeymoon suite,’ lounge pieces that work back to the robe. Lounge is such an important part of the collection. They are perfect resort dressing- the pop-over is great to slip on and run down to the lobby or put on the bralette and tap pant with a jacket and go to dinner. Lounge is crossing over and these pieces truly speak to that. The depth of the collection gives our retailers that perfect three-piece sale. Earlier this year, we talked about how Layneau’s FW15 collection was inspired by the allegories and iconography of Medieval and Baroque Europe, how were the pieces in Isabella influenced by these subjects/time periods? Color! Isabella is all about color this season. I spent two days in the Belvedere Palace in Vienna and soaked in the amazing collection of medieval art. I was so moved by the passionate intense use of color. Second was the drapery, the shape of the sleeve and the hood are right out of those beautiful paintings. 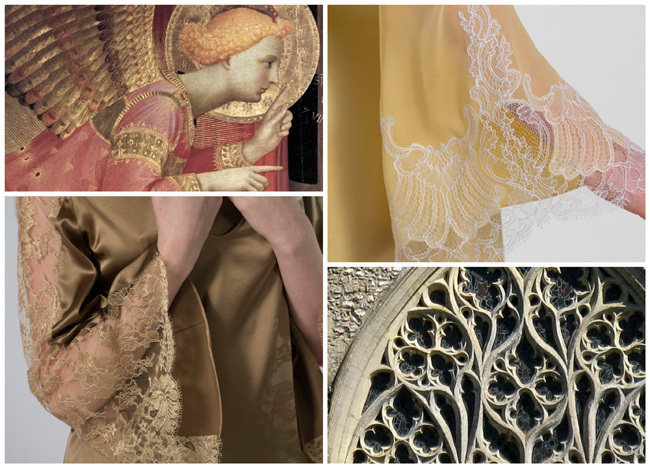 The lace is really influenced by the tracery of those stunning windows in Gothic and Romanesque churches. In architecture, tracery is the stonework elements that support the glass in a Gothic window. How did this architectural detail influence your work within the Isabella collection? It’s the lace really — it makes me think of the open work at the top of gothic windows. It is impossibly elaborate and delicate yet quite strong. The way we clip away parts of the silk under the lace reflects the light coming in through this detail. The play of shadow and light, opacity and transparency are evocative of the light streaming through the window. Constructed to last generations, meticulous seams and attention to fit are evidence of designer Kaaren Bedi’s extensive design experience, pooled together from years as a costume designer, wedding gown couturier and fine antique jeweler. Now, LAYNEAU’s bespoke pieces are crafted by hand in the label’s Portland atelier, taking great care to both cover, and reveal, strategically. Named after Lindsay “Layneau” Boudreaux, an up-start French immigrant credited as the first professional lingerie designer in America, LAYNEAU represents enduring allure for the woman with great thought, purpose and vision. LAYNEAU is worldly and sophisticated, witty and commanding, ripe and fearless. LAYNEAU is Liz Taylor, Carla Bruni, Catherine Deneuve, Edith Head, Marion Cotillard, Carmen Dell ‘Orefice, Diana Vreeland, Virginie Amelie Avegno Gautreau (Madame X). The LAYNEAU woman understands the power of subtle theatricality and has the confidence to be outrageous if needed; to delight in maturity and embrace the brevity of life. Barbara Gram is a proven Sales and Marketing professional specializing in the women’s luxury market. Her knowledge of branding and digital marketing are key factors in her ability to develop, sell and close meaningful retail programs. Barbara’s accomplishments include the launch of the Naked Princess Lifestyle brand as well as the Naked Princess Flagship Store opening in Los Angeles, May 2014. In addition to the brand debut, Barbara parlayed the launch and PR attention received into distribution agreements with Nordstrom and several Lingerie specialty stores. Her diverse skill set has also shepherded the launch of Steve Madden Accessories at Fred Meyer, the debut of beauty brand Royal Apothic at Antrhopologie/Urbanoutfitters and the establishment of the luxury division at Allegro Conair. Barbara joins Layneau with over 20 years of Buying, Sales, Merchandising, and Marketing experience.